This is the first time seeing this. I always love coming across films that I have not seen. It’s always a treat and wonderful experience adventuring into older films when you have no knowledge of them. Especially when the film stars’ dynamic performers. The wonderful, beautiful, amazing and all around brilliant actress Jean Simmons. Jean was an actress that not only could create a character in a film, but possess that character and mold that character into a breathing, living persona. The character of Mary Wilson in The Happy Ending is no different from that living, breathing persona. She owns, operates and transcends her character on and off screen as a believable persona. That is what makes her so important in the annuls of film history. Simmons was the very essence of Hollywood. She goes up there with all the greats. I have always felt she never got the legendary status like many others. When I think of the all the greats like, Grant, Bogart, Cagney, Crawford, Davis, just to name a few, I think of Simmons right along with them. She is an important part of cinema history. Any true film historian, film buff will know and recognize her warrant of expertise in cinema. It’s always a fantastic treat to see her perform and The Happy Ending is another treat. Also starring an ensemble cast of perfection. The extraordinary John Forsythe who really needs no introduction. The beautiful Shirley Jones. The one of a kind Lloyd Bridges who has an impressive tally of over 200 performances in his career. The whole cast is excellently performed and directed. The film is a worthy film to praise and remember and thankfully Twilight Time has honored this film, with an excellent transfer to Blu-ray. Directed by Richard Brooks. Brooks was truly one of the best directors to ever grace the movie world. He has directed so many wonderful pieces of film. Films such as the flawless masterpiece 1967’s In Cold Blood. The masterpiece 1958’s Cat on a Hot Tin Roof. The amazing 1962 Sweet Bird of Youth. He was a writer, director and producer of so many wonderful pieces of cinema. I feel he was a director that was never really honored in the limelight of cinema. He should have been and should be mentioned when all great film directors are spoken about. He was a dynamic writer. He scripted so many wonderful films. He won an Oscar for best adapted screenplay for the amazing Elmer Gentry (1960). Interesting to note he married Jean Simmons and they were married for almost 20 years. 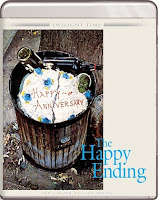 The plot to The Happy Ending is an array of drama of the 1960’s, and the coming 70’s. You are introduced to Mary Spencer in 1953. She drops out of college to marry Fred Wilson. You then move to 1969, it’s 16 years later, 16 years of marriage. Mrs. Wilson boards a plane to the Bahamas where she remembers the past anniversary and the many years of marriage. This is a film mixed with drama and the what if’s, or what could have been. It’s a mix of changing your life, surroundings and questioning the present, and moving to change the future. Jean Simmons acting is so good in this film the Academy Awards nominated her for an Oscar. She didn’t win but her performance in this was truly Oscar worthy. Also what needs to mentioned is the songs written for this film. I feel the songs What Are You Doing the Rest of Your Life? And Hurry Up ‘N Hurry Down and Something for Everybody are pieces of film music that create a setting in themselves. Michael Dees sang the song What Are You Doing the Rest of Your Life? for the film. The song was nominated for Best Original Song for an Oscar and it rightly should have won. The acting, direction and music all create this film. It’s a film that comes together with amazing performances. Dynamic script. Flawless music. Never seeing this before I have nothing to compare it to, but seeing it with this transfer to Blu-ray by Twilight Time, it could not be any better. The colors and imagery, are crisp and the audio is pure. Another fine example of how to treat an older film and give it a new worthy product. Slim pickings on this outing, but you do get the all import isolated score. The music was done by a wonderful composer and master musician Michel Legrand. Not only a composer, he was an arranger, conductor, and an amazing pianist. His mastery was a wide range of film and TV scores. A huge accomplishment of over 200 scores. He won an impressive 3 Oscars and many nominations. As of this writing his last work was in 2014. His career has been of a grand nature. The Happy Ending is a prime example of his mastery. His talent is truly something to praise. His music has continued to be used on Soundtracks to this day. One of my favorite films that he created music mastery for, was the stunning, and film importance, 1971’s Summer of ’42. Legrand brought life to every piece of film, no matter how great, or small the entertainment was, he left his mark. Another fantastic release by Twilight Time. Beautiful transfer to blu-ray. An amazing audio and video reality. A wonderful added isolated music track. Seeing this for the first time, I am utterly happy I got to experience it on this wonderful Special Edition 3,000 Unit production of this classic film. A stunning cast of amazing performers. Tightly directed. An awesome music score. Simply put a must own, must experience product. A truly memorable film, given a high class treatment.